The Workshop Discussion on Hydration Forces will take place in the central building of Sofia University "St. Kliment Ohridski" (Rectorat) [map], pronounced in Bulgarian: Sofiyski Universitet "Sveti Kliment Ohridski" (Rektorat). The name of Sofia University is after Kliment Ohridski (840–916), who was one of the disciples of Cyril and Methodius. Klement Ohridski (Clement of Ohrid) designed the conventional version of the Cyrillic alphabet and educated thousands of people to read and write. The Worksop will take place in the new conference hall (2nd floor in the North wing of the building)! Because the central entrance is often closed, to enter the building the participants are advised to pass the so called "tunnel" at ground level and to use the side entrance (see the scheme below). 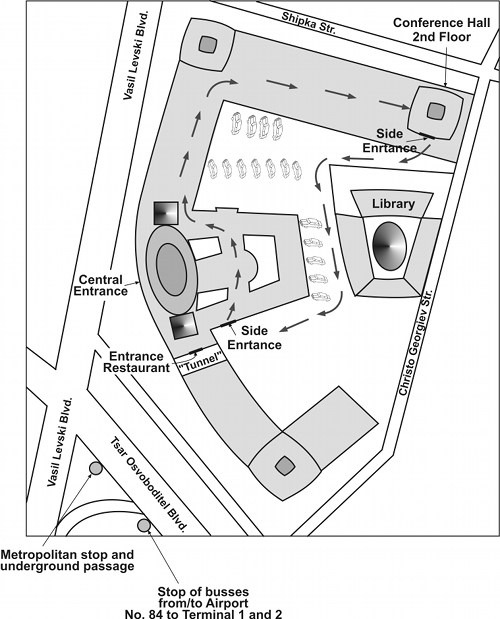 The entrance of the Restaurant of Sofia University (SU), where the get-together party and the lunches will take place, is from the "tunnel" [map].